Ashbourne Town hall is in the heart of Ashbourne, this building was built in 1861 and stands on the previous built Talbot Inn. This location is a hidden gem with an array of many rooms. The ballroom here is known for its disembodied voices, on many occasions the door has been seen and heard slamming shut from unforseen hands. The upper floor kitchen dark tall black figures have been seen, and some have reported seeing figures in the upper floor windows. The main hall is known for its sudden drastic tempertature changes, many people feel extremly uncomftable here alone. Are you ready to unlock the doors and see who and why is haunting Ashbourne Town hall ? There has been hundreds of reports of strange unexplained happenings within these walls at Ashbourne Town hall. There have numerious reports of footsteps coming up and coming down the stairs when noboby is present. Doors heard and seen slamming shut from unforseen hands. The sound of disembodied voices and even childs laughter and singing has been heard. Items have been left in a certain position and staff members upon their return have found these items moved. Sudden and unexpected drastic temperature changes. Dark tall figures are seen. Many believe is location is home to many lost souls. We invite you to join us on this evening to see who is haunting this vast place. The building is faced with ashlar stone with the over-fussy decorative embellishments typical of the mid-Victorian period. A purpose-built meeting room was first suggested in 1852, and was combined with a proposal to build a Market Hall. Subscriptions were collected and various premises in the Market place were considered, but the scheme was postponed through lack of sufficient funds. A number of local tradesmen formed a trust to purchase a property in St John’s Street, which was rebuilt as a lecture and meeting room (now St John’s Gallery and Café). The Market or Town Hall went ahead as a separate project and, eventually, another property was purchased in the Market Place and rebuilt as the Market Hall. The stone pediment shows the date 1861 along with the names of the Trustees. The Hall was built on the site of the Talbot Inn, mentioned in Izaak Walton's and Charles Cotton's "The Compleat Angler". In the book, Piscator Junior and Viator stopped here for a drink on horseback before heading for the River Dove at Milldale; an early form of a "drive through". 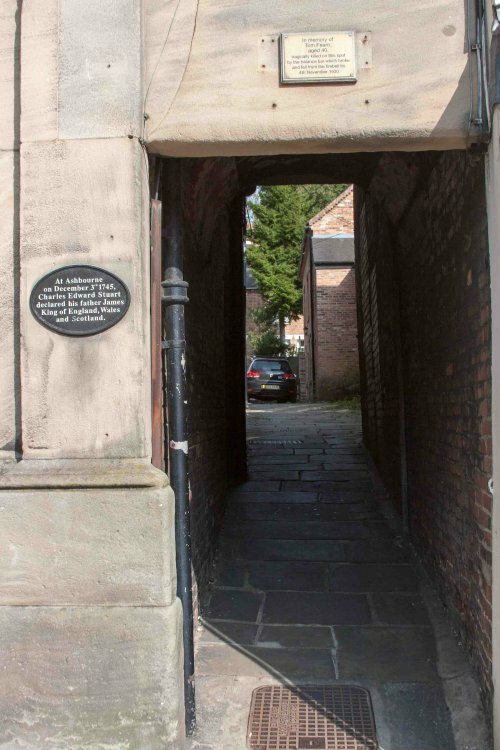 Just above the entrance to Town hall Yard is a small memorial to Mr Tom Fearn, aged 40, who was killed when the balance bar fell from the firebell, which used to be situated above this entrance and was being rung because of a report of a fire. The bell was used to alert the fire crews to man the fire engine, then kept at the rear of the George and Dragon. Sadly, on this tragic occasion, the alert proved to be a false alarm. The phone call was traced to Ellastone but the culprit was never discovered. Mr Fearn's descendents still live in the Town and arranged for this memorial to be erected in his honour. A Brief tour of the location with the lights on Working in small groups. Ouija/spirit board sessions, EVP Sessions, Table tipping and seances. Tea/ Coffee and light snacks are provided. Please remember to bring a torch as this location is very very dark ! remember to wear warm clothing and suitable footwear. This location is not suitable for anyone with mobility issues.